The remarkable story of one gutsy contractor's determination to end poverty in Africa. Grant Smith is not a visionary or an enthusiastic missionary. He's a problem solver. When confronted with the desperate problems of poverty he witnessed in Africa, he did the only thing he knew how to do--business. Business that would provide jobs and pay people enough so that they would not have to rely on charity to send their kids to school, so that none would be forced to live in a tin shed without water, electricity, sewerage, or dignity, fighting off the threat of pneumonia every time it rained. His venture led to a great challenge: become the biggest house-builder in Kenya. Both humorous and realistic, Smith tells of his successes and failures with projects as diverse as growing oil crops, a road-building scheme, house building, and selling old gas pumps. With faith in God's provision--and a little bewilderment--Smith wrestles with difficulties that every entrepreneur knows too well: finding investment funding only to lose it again, acquiring trustworthy business partners, confronting bribery and bureaucracy, corruption and culture. He is not the biggest house-builder in Kenya (yet! ), but Smith has stumbled on a near-miraculous way of unlocking long-term financial provision for local Christian charities. For those who dream of making a difference for communities affected by poverty, this story is inspiring and thought-provoking. It encourages readers to see how ordinary people have been created for a purpose and have the potential to facilitate miracles. The Accidental Social Entrepreneur is a real challenge to consider how we might use the gifts and resources we have been given by God to change lives. 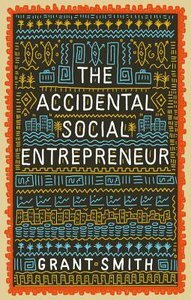 About "The Accidental Social Entrepreneur"